He credited his party's workers for the wins, calling them "babbar sher"
Rahul Gandhi, exulting in his Congress party's state election wins, said it was clear that Prime Minister Narendra Modi would find it very difficult to win elections. "Clearly, there is a feeling that PM Modi was unable to deliver what he committed," the Congress president told reporters Tuesday evening. 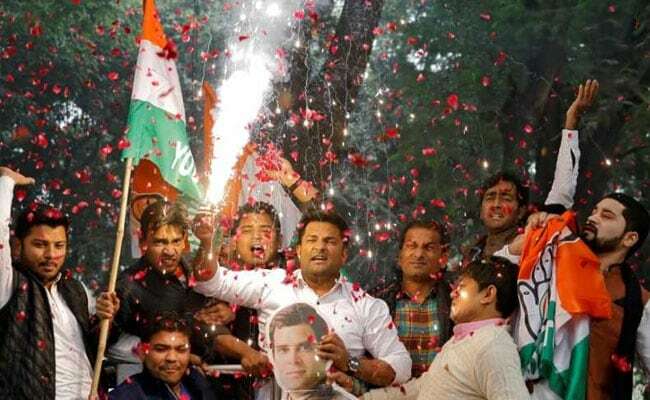 The Congress won in Rajasthan and Chhattisgarh and fought a close contest in Madhya Pradesh in the state elections billed widely as the semi-final, the last popularity test before the 2019 national elections. It lost Mizoram and failed to perform in Telangana but its wins in India's heartland have overshadowed the setback. "When PM Modi was elected, he was elected on platforms like employment, corruption. Now, voters are disillusioned. They believe the PM is involved in corruption. And these losses are the result of that," said the Congress president. For Rahul Gandhi and the Congress, it was one of the best poll counting days since 2014, when the grand old party was decimated after 10 years in power and PM Modi came to power. "I was telling my mother that the absolute best thing for me was the 2014 election. I learnt a lot from that election. I learnt that the most important thing is humility," said the 48-year-old Congress chief, who took a lot of the blame for the party's non-stop election disasters. "Frankly, Narendra Modi taught me the lesson - what not to do," Rahul Gandhi remarked. "PM Modi was handed a huge opportunity. It is a sad thing that he refused to listen to the heartbeat of the country. The arrogance came in." It was, he added, a "nice journey" from 2014. "There was a little bit of a beating but it is a good thing, not a bad thing...," he quipped. On the acrimonious campaign, which saw him targeting the Prime Minister repeatedly with the phrase "Chowkidar chor hai", Mr Gandhi said: I did not use any objectionable language. The youth of country elected the PM to work. They want the economic structure of the country to be revived. The PM Is paralysed, he is not able to respond to the pressure of the opposition." Mr Gandhi credited his party's workers for the state wins, calling them "babbar sher (lions)". He dismissed speculation of tussles over the chief minister's job in Madhya Pradesh and Rajasthan. "There won't be any big issue of chief minister," he said.